Ok, we’ll admit it, it’s another tenuous link but we couldn’t resist this picture - and you'll have to click over to the next page to find out what it is (!). 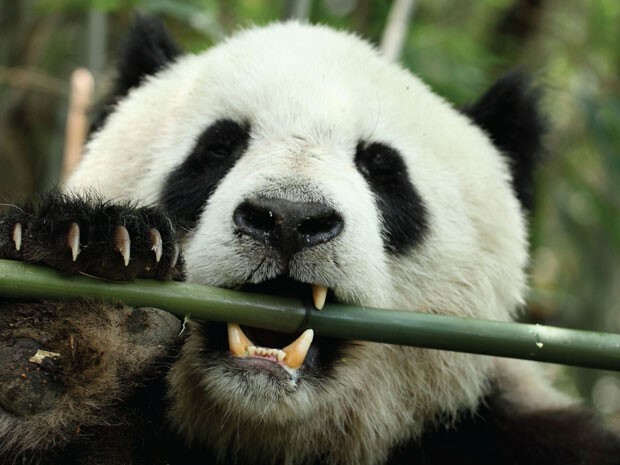 Sadly it’s not about pandas or the benefits of making bamboo a regular part of your diet (!). Once again we have our clients to thank for providing the inspiration for this week’s topic. Not only for demonstrating the many different causes for so called “panda eyes” but for also reminding us of their common underlying link. When talking to clients about this subject we often find they have no idea how thin – and delicate – the skin around the eyes is. While most of the body is protected by skin 2 to 3mm thick, that around the eyes is much thinner, usually around 0.5mm. As a result the tiny blood vessels found just below the surface of the skin are much more visible, making this area appear to be a slightly different colour from the rest of the face. For this reason it’s often said that this area provides a direct reflection of what’s going on below. And we’ve found this this to be very true, as we’ll shortly explain. People with fair skin – and ironically those with dark skin too – naturally have darker areas under their eyes. Hence hereditary factors often being blamed for panda eyes. Added to this the skin loses collagen and elasticity with age, so thinning the skin further and making any dark patches much more prominent. What are the common causes of panda eyes? Hyperpigmentation, in other words, more melanin being naturally produced in the skin around the eyes. Since melanin’s main function is to protect the skin from damage by the sun, it makes sense that greater amounts are produced here, where the skin is thinner and more delicate. A similar response can also be caused by Contact Dermatitis, where the skin – or eyes – come into contact with a substance that acts as an irritant. Common culprits are makeup, facial lotions and potions and air borne particles that act as irritants. Again melanin is produced to protect the area concerned. Finally, certain drugs have hyperpigmentation as one of their known side effects. Steroids are probably the best known example of this, whether they’re taken internally or used directly on the skin in creams or lotions. And it doesn’t need to be on the area affected either. Long term stress is also known to lead to dark circles under the eyes, which is a classic sign of adrenal exhaustion. As most people know, the adrenal glands release adrenaline to help us survive life or death situations. Intended as a short term emergency response, adrenaline rapidly runs down the body’s energy reserves when ongoing stresses are faced. Chronic Fatigue, ME and Exhaustion are the common end result; with the myriad of symptoms including the tell tale dark rings under the eyes. Poor sleep and insomnia have a similar effect. This is partly due to the body relying on lower levels of adrenaline to plug the energy gap from too little sleep; but also to increased toxicity, as much detoxing takes place at night while we’re asleep. Poor diet, along with sensitivity to certain foods, also raise toxicity issues as the body struggles to deal with certain foods. Common culprits are wheat and dairy, both of which the body finds difficult to digest. They may also cause puffiness under the eyes too, as both can lead to fluid retention. Linked to this is ongoing dehydration, which also increases toxicity and so can lead to panda eyes. Finally, certain nutritional deficiencies can also have a similar effect. The best known is Anaemia – iron deficiency – although it can also be seen with low levels of the B Vitamins which are needed by the adrenal glands to function efficiently. And what is the common link? While it may not be immediately apparent, from a traditional Chinese medicine point of view, the common denominator shared by these different causes is the kidneys. And if you think about the many different functions the kidneys carry out every day it’s easy to see why. To start with the kidneys control water balance within the body. This includes the composition of the blood, with water accounting for a large percentage of the blood’s volume. Not surprisingly dehydration has a major impact on kidney function, with many people simply not drinking sufficient water – or too much caffeine (!) – these days. The blood stream is also the route by which toxins are sent to the kidneys for removal and elimination via the bladder. A lack of water, dehydration, simply makes this process much more difficult. Sitting on top of the kidneys are the adrenal glands, which produce adrenaline to initiate and maintain the emergency response, whether in the short term or long term. Not only does adrenaline have a direct effect on kidney function – as frequent trips to the toilet can testify – but it also runs down the kidneys own energy reserves where stress is repeated or longer term. Along with adrenaline, the adrenal glands also produce steroids as part of the emergency response and also to assist with healing. The use of steroid medications mimic this response, so placing them under additional strain as a result. There are no prizes for guessing what we’re going to say (!) so here we go. Make sure you drink plenty of water. Cut down on caffeine and alcohol, both of which are dehydrating. Clean up your diet by avoiding processed foods, particularly those with a high salt content, which place a huge amount of stress – and extra work – on the kidneys. If you suspect that allergies may be partly to blame, consider taking an allergy test to help pinpoint possible culprits. To find out more, please do call or e mail us. Look at what is causing stress in your life and take steps to remove it completely or, at least, reduce it to a manageable level. Make sure you take time out every day to recharge your batteries. We often say it, but 20 to 30 minutes every day can make a huge difference over the longer term, provided it’s done as part of your normal routine. Use only natural skin care and makeup products. And remember to be gentle when applying or removing make up. Wear eye protection when out in the sun or doing work using chemicals or creating dust; all of which can irritate the eyes and so the surrounding area. Smoking increases the speed at which collagen is lost from the skin, as well as being very dehydrating, so making matters worse. Slices of cucumber or damp chamomile tea bags are wonderfully soothing and can help reduce darkness under the eyes. A cold compress, or gently splashing the area with cold water, can help too. While we all take it for granted, the human body is incredibly intelligent and has an innate healing ability if we give it the time and resources to do so. Panda eyes, like so many other of those “annoying” minor symptoms, are no different and can be easily improved with only small changes to our daily routines. And the best bit is that all these changes we talk about have wider health benefits too.